When using DocumentsCorePack (DCP) in different environments (office, home, etc.) it is necessary to configure 2 profiles for the client. One for the IFD connection and one for the standard connection. These profiles are configured via the DCP dataprovider on the client. This article contains a detailed guide on how to find out the version number for each mscrm-addons product in CRM 4.0. Meldung: 2104 An error has occurred. 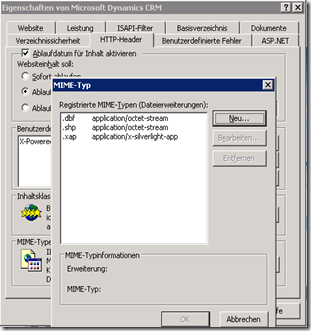 Sobald diese Meldung erscheint, bitte die MIME Einträge am Server (IIS) überprüfen! Outlook 2010 is having some severe problems with Ajax based functions. Being a reported error with Microsoft, there is still no fix available, but a workaroud. You are trying to read or write to protected memory, this is a sign that the memory is corrupt. The reference is not set correctly. This is caused by the Security Update for 2007 Microsoft Office System (KB2251419). You have to delete this security update and the merge will work without any problems. Falls nach der Installation von DocumentsCorePack die Toolbar nicht angezeigt werden sollte oder aber die Toolbar im Betrieb verschwindet, kann man ein angefügtes Tool zur Diagnose ausführen. SSL enables browsers to communicate with a web-server over a secure channel that prevents eavesdropping, tampering and message forgery. You should always use SSL for login pages where users are entering usernames/passwords, as well as for all other sensitive pages on sites (for example: account pages that show financial or personal information). Configuring SSL on Windows with previous versions of IIS has been a pain. Figuring out how to install and manage a certificate, and then associate it with a web-site, is something I bet most web developers don't know how to enable.